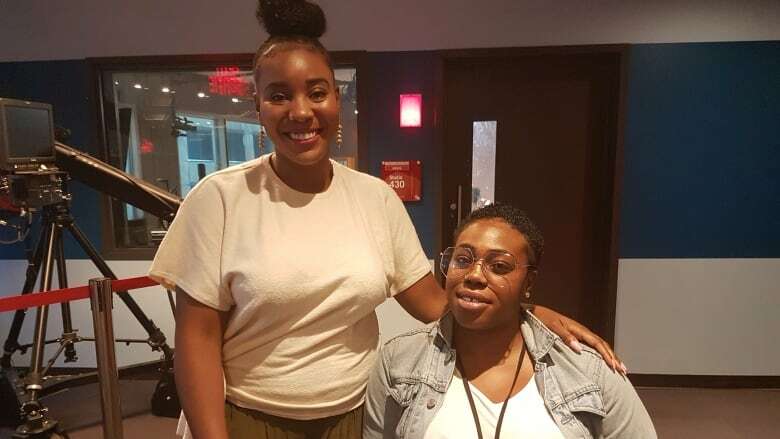 As Toronto grapples with a string of shootings, two women caught up in violent incidents are speaking out about the life-long impacts of being victims of gun crime. They were celebrating, and then all of a sudden two innocent women were shot. Now, the women, who were injured in separate high-profile incidents, are speaking out about what it's like to be the victims of violent crime as Toronto grapples with a string of shootings. The latest shooting incident in the city occurred early Tuesday morning, when a man suffered serious injuries after being shot at King and Portland streets. Over the holiday weekend, two people were killed and one woman injured in a shooting at Queen and Peter streets, while four people were injured in a shooting in Kensington Market. The violence has sent Angie Hutchinson and Rochelle Lewis hurtling back in their minds to the days their lives were forever changed by gun violence. Hutchinson, 26, was shot in the leg as she fled gunfire at the city's infamous Danzig Street shooting in July 2012, while Lewis, 28, was shot at her own birthday party in July 2017. Lewis now uses a wheelchair as a result of her injuries. Reading the latest violent news headlines has left Lewis upset, but also empathetic toward the victims and their families. "I could not even imagine how each family, what they're going through, how they're feeling," Lewis told CBC Radio's Metro Morning on Tuesday. "I don't want to watch the news anymore. It's disgusting." You can listen to the powerful interview with Hutchinson and Lewis in the clip below. Of her own experience, Lewis recalled how she planned her birthday party as she had for the previous 14 years. Last year, the theme was denim and white, and as always, she said everyone was having a good time. Suddenly, she found herself on the ground with her friend in her arms. "I was screaming out, 'no he has a daughter, what's going on?' At that point I didn't even know I was shot," she said. "Seconds later he turned, looked at me and took his last breath. I felt numb. Then [I felt] some vibrations going through my body. I didn't know what was going on." The next thing she knew, she was waking up in the hospital and the doctors told her she had been shot. "It was a birthday party. How do you come to somebody's home? That is disgusting. You come to somebody's home and you go for somebody," she said. "If you have a beef or whatever you want to call it, keep that on the streets." Lewis was also at the Danzig Street barbecue where Hutchinson was shot. Both women said they weren't keen to go and had a strange sense of foreboding while they were there. "I hadn't gone to anything throughout the whole summer and I thought, 'I need to enjoy myself,'" Hutchinson said. "And the whole time I was there I had this eerie feeling that something was going to happen. And I was in my own little corner, just observing and not really enjoying myself, and then shots started to ring out." Hutchinson was shot in the leg as she fled the gunfire. "I can't stop thinking about the pictures of people laying on the ground, all the sirens, all the ambulances. It was just a chaotic mess," she said. "I just remember at the time thinking, 'why me, why me, why did this happen to me?'" Both women say they were gripped by depression in the months after the incidents. "I didn't even want to get out of bed, I didn't want to eat, I didn't want to talk to anybody, I didn't want to see anybody," Hutchinson said. "I went into a little shell." For Lewis, she suddenly had to adjust to life in a wheelchair. Before the shooting, she often held down multiple jobs, styling hair, bartending, working in customer service. "I was always on the go and this just slowed me down completely. For me to depend on others to do things or get things done, it's frustrating," Lewis said. "To go through the pain where it leaves me in tears, I can't sleep at night." She suffers flashbacks, and doesn't want to cry in front of others. She is also seeking answers, as the shooter in her case has never been caught. "It really hurts that a year is coming really quickly and the only thing I can think of is the friends who have passed away and their children are now fatherless," she said. The Danzig Street shooting shocked the entire city. Both women are still working to resume their lives. Hutchinson is a counsellor and crisis worker in Scarborough, and has started a program for at-risk youth, females aged 12 to 18, that teaches them life and entrepreneurial skills, while also offering mentorship opportunities. As a troubled youth growing up, she "always wanted a mentor. I always wanted somebody to talk to and to teach me the skills that I teach the girls." She is also considering starting a reintegration program for people getting out of jail, who she believes are caught in a cycle of violence without proper support. For Lewis, the struggle is to find her typical happy, outgoing self. "She's hiding," she said. "I'm not used to being in a wheelchair, seeing myself like this. I've gained weight, extremely, so I'm insecure." During the interview, Hutchinson gave Lewis a pep talk, encouraging her not to give up on herself, or her future. Lewis wiped away tears as she listened. "I tell myself that as a pep talk, but to hear somebody else say it to me I have to give myself that hope and I am grateful there are kind people out there," she said. For Hutchinson, she may dislike the scar on her leg that reminds her of the shooting. But she is also grateful.